My Creative Time: Northern California Circle Crop!!!!! Okay, after our shopping spree, we finally made it here to Chevy's! This is the night before the crop! Finally at the crop!! Liz & I carpooled together & Diane & Katie carpooled up together! isn't this EXCITING!!!!! ;) Miss Angie now has a CUTE Circle tote!!! Here is everyone posing w/our handmade glasses for the contest to win the "Mini Cake" machine! Look at all of these FUN glasses! Okay, this was definitely one of the highlights for me!! I got these SUPER ADORABLE calling cards from everyone! I have more, but my camera battery died:( These are the ones I was able to take pics of! Here is mine! I cheated:( There was NO WAY I was able to make 55 cards w/my injured back:( So I had to call in reinforcements!!! ;) Even though they weren't "Handmade", I just LOVE how they came out! Here is the ONE card I made at the crop using the NEW set from Peachy Keen called "Mitsy Sue & Colby Cheer Up Set" This set is SOOO ADORABLE!!! ;) The sentiment is from my stamp set called "Pain Pain Go Away"! Looks like so much fun!!! I wished i could be at something like this one of these days! I really love the shirt and the glasses!! Both...so cute!! Looks like a blast! I really wanted to go, I was sooo excited when I heard a meet up was coming to Northern Cal, but it ended up being on the same day my DD's class was going to the zoo and I was a chaperone. Hopefully there will be another one in the near future. Thanks for the great pics! Love the pics, Emma! We sure had a great time, didn't we? By the way, I saw that the Yudu is on sale now at Joann's!!! 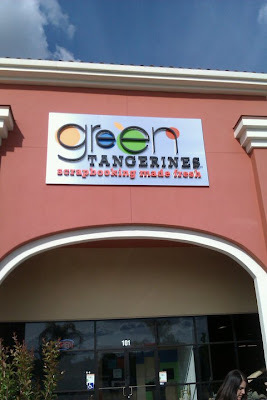 I love Green Tangerines! I don't get there often enough! And, naturally a nice Chevy's meal is always in order when I am in that area. Glad you had a great time and here's to your back feeling better soon! Glad you had fun Emma! Glad to meet you and hang out with you! Looks like you all had a fab time!!! The shirt and the glasses are super cute!!! How great to have this get together with such talented ladies! looks like you had tons of fun!! will you be making t-shirt to sell?? ;) yr calling card came out super cute! Looks like you guys had an amazing time! Love all the projects you made especially the glasses and shirt. I thought your calling card was perfect. It's obvious you girls had a good time. I love when I can get away for a scrap weekend and find new scrapbooking stores to explore. Great Pictures Emma.. I should have taken more...Your glasses were adorable.. I was so busy snapping pictures to look at them all.I am thinking about the Yudo too, better run to see what JoAnn's prices are! Looks like a fun time was had by all (including Liz). Thanks for sharing your pictures. Oh man!! You guys were so close!!! You should have called!! 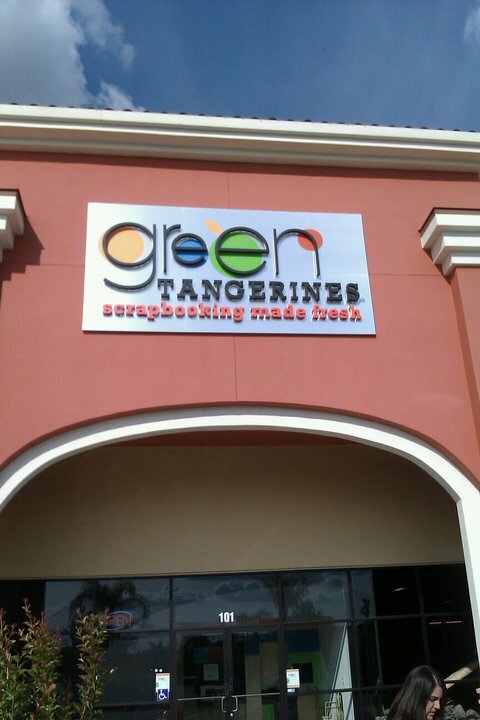 lol I shop at Green Tangerines every time I go down to Sac!! Isn't it the best?!? Looks like you all had fun, thank you for sharing the pics!! Thanks for sharing your fun! I wish we had something like that here in Tennessee. I hope your back is better.....I know how u feel,my back went out last week and my chiropractor is on vacation unit the 13th.....I thought your card was great and loved your glasses. Your cricut glasses are adorable. You look like you had lots of fun. It was so nice to see you again. Thanks for sharing the pics. We did have a great time huh! That scrapbook store was the bomb! It was nice to hear your hubby is doing fine. I loved your glasses. I was so happy with my tote bag too! Hope to see you again real soon. Love Angie! Wow what a super fun event!!!! Thanks for sharing the pics with us, Emma. Wonderful projects and really great group!! Sounds like such a terrific weekend! I live in the area and glad you were all able to visit our local scrapbooking store.